Cut out the manual math problems. Doing manual calculation for electricity usage for seasonal or long-term stay guests can be a massive chore at the end of a stay. 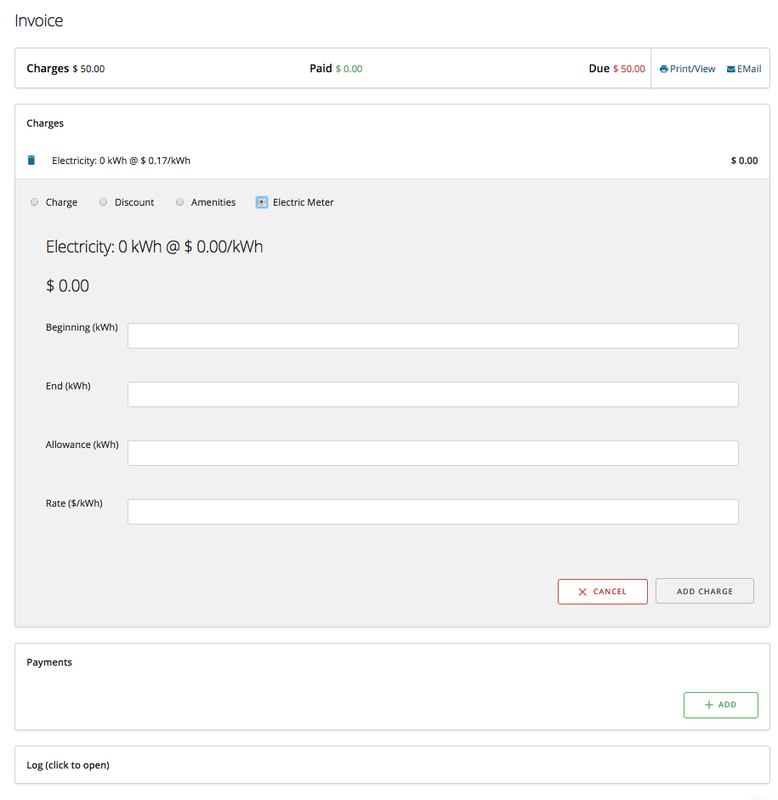 Bonfire offers an electric meter charge calculator that will cut your calculation time in half. Simply enter the beginning and end reads, a rate, and any allowance, and the charge will be added to the reservation. Over the holiday season, this feature will be updated to store all the reads for a more automated process. While not a new concept, Bonfire’s calendar rack is strictly maintained for simplicity of use. While there may be similar products on the market, you’ll experience the immediate difference with Bonfire’s. Our primary focus when developing this software was to be the simplest to use. The rack is a calendar representation of your reservations organized by spot and date. Various tools on this feature page make finding reservations a snap. With the color coordination and hover over details window, you don’t even need to open the reservation to check in a returning guest. Not every park owner is ready to put all of their sites online for the masses to book. Bonfire’s online booking page is a dedicated webpage that ONLY shows your specific park’s available sites. Meaning, your park is not playing the “competition game” with other parks like most travel booking engines. 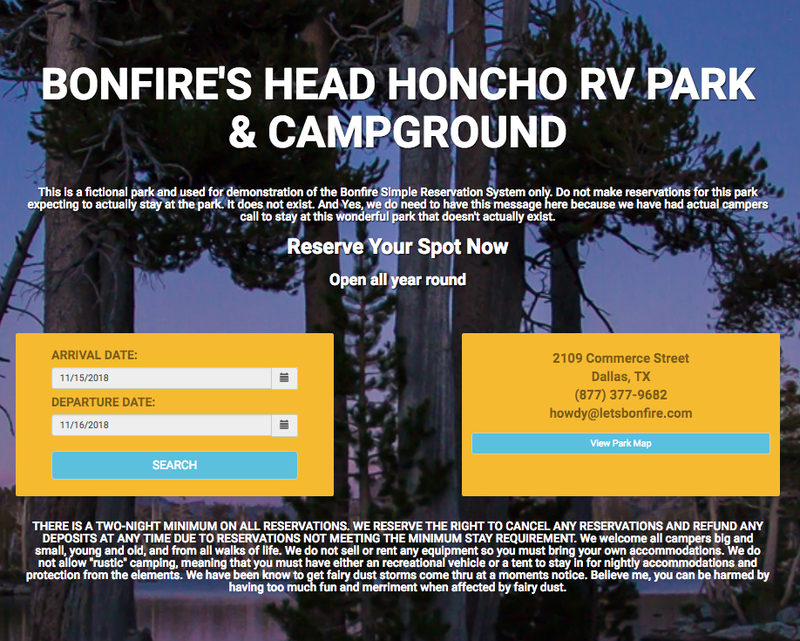 Your online booking page is connected with your campground’s website so that your camp guests stay at your park. While a campground’s primary offering is a spot for your RV or tent, many parks have other offerings ranging from actual products and parts, to activity packages and events. With Bonfire’s amenity feature’, parks can add a whole list of items or “extras” to offer to your guests. The amenity feature is connected to three other areas of the software so that you can maximize exposure to these revenue-generating, experience enhancing extras. The amenity feature is connected to the reservation management workflow, the terminal, and the online booking page. The terminal is a virtual cash register. Normal Point-Of-Sale systems are hugely complicated. But Bonfire is focused on “simplicity”. So we have created a simple POS system that ANY smaller campground can use as a regular tool to account for, charge for, and offer many items for singular transactions. Your guests can pay with their credit card without having to bother with searching for and updating a specific reservation. Campgrounds and RV parks thrive on repeat guests. You sell an expirable product. Every night that a site is not occupied is a night of lost revenue. So repeat guests are the best way to maximize revenue. The Bonfire Guest Book keeps the reservation and stay history of all your guests that have stayed at your park. Use the Guest Book to keep detailed notes on your campers and welcome them by name next time they call to inquire about available dates. COMING IN DECEMBER 2018, Bonfire will be updating their rate structure to incorporate dynamic rate structures. Every park operates in similar ways. But you also each have a unique approach to how you set your rates. With the coming rate update, parks will be able to “build” rate structures based on periods and events. So, for parks that are year round tourist destinations, you can offer online bookings that automatically incorporate weekday, weekend, and holiday rates into your regular season pricing without ever having to manipulate the rates in your setup editor. Look for this update in late December. The Campground industry is changing. The average camping age is decreasing. More campers are using technology. Time is a resource that no one can afford to waste. If you are a campground owner or manager that has recognized the sign of the changing industry and would like to pursue an upgrade to your campground operations, check out Bonfire’s Simple Reservation Management Software, schedule a call with the Head Honcho or ask a question. Good things are happening!